Upstate New York was a far cry from Washington, D.C. and Capitol Hill, where I had spent the last two years taking in the culture and politics of the Nation’s Capitol. But being the restless spirit that I was, I decided it was time to go back to school. Less than challenging and low paying jobs and a desire for something more propelled me to New York. In my usual “eenie meenie miney mo” fashion, I picked three Upstate New York State schools, hoping that one of them would see past my lackluster high school transcripts. Luckily, it was an open enrollment year at SUNY Brockport, so I exchanged my Second and Pennsylvania SE pad and a fast paced city lifestyle for a pile of books and a dorm room with girls four years younger than I. The year was 1979. Newly erected and a few hours east of my alma mater stood the Empire State Plaza. Albany, State Capitol of New York, often overlooked for the brighter lights and flashiness of New York City, had undergone a makeover, compliments of Governor Norman Rockefeller, a man known for his love of contemporary art and architecture. Twelve years in the making (1966-78), it was an ambitious and controversial project. Long standing Italian and Jewish communities were demolished via eminent domain as a hundred acre swath of land was excavated in the heart of the city. It was as though the skyline had been visited by an alien civilization as modern and brutalistic skyscrapers emerged, replacing archaic 19th and early 20th Century structures. But none of these buildings were more compelling than The Egg. At least that’s what I thought the first time I saw the tipped saucer structure while passing the city during a road trip with my college buddies. 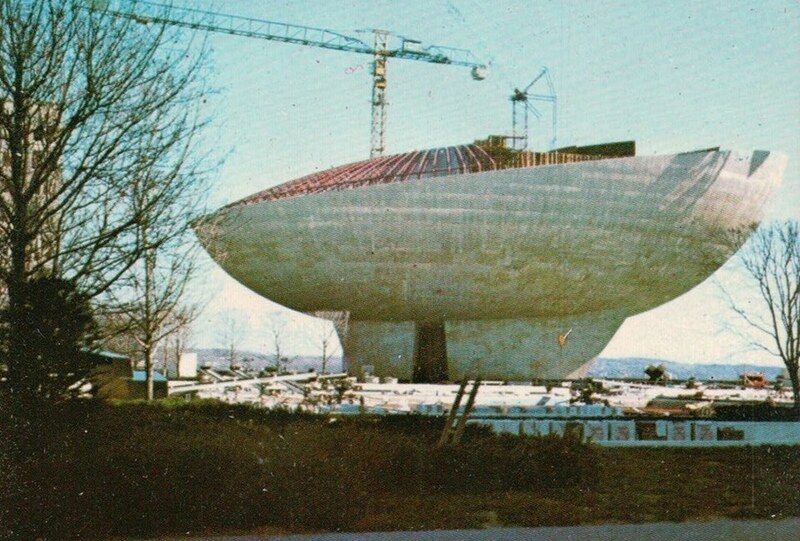 “Conceived one morning over breakfast as the governor placed half a grapefruit atop an empty milk carton” (Smith xxvi), The Egg, which took longest to build and was last to be finished, became a performing arts center designed by Wallace Harrison, who was well known for his work, which included the Lincoln Center and the United Nations Building. Emulating Brasilia’s modernist architecture and the brutalist sensibilities of the period, the structure was kept in place by steel beams that were lodged six stories underground. In addition eighteen inch slabs of reinforced concrete were poured to avoid shifting and other catastrophes that had befallen similar structures in the past. Inside, sky lights were placed on the ceilings which were meant to represent galaxies and constellations, giving one the feeling of a planetarium. Many years later, my eye continues to be drawn to The Egg each time the Albany skyline comes into view during early morning travels. Ultimately, Governor Rockefeller left behind a marvel that is utilitarian and beautiful in its simplicity, but which also speaks to Modernism in the 20th Century. Works Cited: Smith, Richard Norton. On His Own Terms. A Life of Nelson Rockefeller. Random House: New York, 2014.